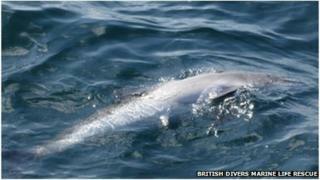 Reports of a dolphin being hit by a boat and killed off Cornwall are being investigated by police. Conservationists claim a pod of bottlenose dolphins was "harassed and disturbed" by about 25 small boats in the Camel Estuary, in north Cornwall, on Saturday. Faye Archell, from the British Divers Marine Life Rescue, said the "death is believed to be as a result of the harassment". Devon and Cornwall Police said it was believed several boats were in the area at the time and one of the dolphins was hit by a boat and killed. The dolphins entered the estuary at about 13:30 BST and "were followed by up to 20 pleasure boats until about 16:45 when they left and headed towards Port Quin Bay" officers said. Police said they were keen to speak to anyone who saw boats circling the dolphins. They also appealed for pictures or video footage. Wildlife crime officer PC Del Allerton-Baldwin said: "We would like to get a list of all boats that were in the area at the time. They should all have names on them. "Many of the boat users were, in fact, behaving responsibly around the dolphins and keeping a distance of around 100 yards. However, a few appear to have been harassing them." The force said people on a pleasure boat in the area saw a dead dolphin in the water. Ms Archell said it was believed to be a juvenile. She said the exact nature of the harassment and disturbance was currently unclear and she was waiting for witness photographs. Ms Archell said: "There is a general appeal for information as it is believed there were a number of private, commercial and sightseeing vessels in the area at that time. "The Padstow sightseeing vessels are all trained in how to behave responsibly around wildlife and there is no insinuation that they are involved. "However, passengers may have witnessed the harassment by other vessels." Anyone with information is being asked to contact Devon and Cornwall Police on 101.